Argentine police evicted PepsiCo workers from the factory they'd occupied to try to save their jobs from a shutdown. Two hours later, a court declared the shutdown illegal and said workers should be reinstated. The struggle won international support. Photo: Enfoque Rojo. On the night of July 13 Katy Balaguer thought she was ready for what was coming next. She was no stranger to protests, to tear gas, to the cops’ batons and the sound they make when they hit the body of your co-workers. That day, from the roof of the PepsiCo factory in Buenos Aires, Argentina, she watched as her co-workers and their supporters were brutally beaten. She watched the cops knock down the door, fire tear gas, and finally, smash open a gas pipe, making it too dangerous for the workers to remain inside. This was the end of the workers' occupation of the plant, an occupation that lasted almost three weeks. As she walked out of PepsiCo, her eyes red and watering from days without sleep as well as from the gas, “we almost had someone killed today,” she said to the dozens of reporters who crowded around. “They dragged us along the floor, they shot us with rubber bullets and tear gas… It’s brutal what they did to us!” A co-worker stood next to her, wiping tears from her eyes, perhaps due to the emotion of the moment, perhaps due to the tear gas—likely to both. Six hundred PepsiCo workers in Buenos Aires packed chips into boxes each day and carried the boxes onto trucks for the U.S. multinational. They arrived at work June 20 to find a note on the door saying that the plant would be relocated and that workers were out of a job. In Argentina, in order to close a factory, a company needs to file a “Crisis Prevention Procedure,” which demonstrates three years of economic distress and that steps were taken to try to save the workers' jobs. PepsiCo filed a Crisis Prevention Procedure after it had already shut the factory, which is illegal. Furthermore, one look at the company's economic reports demonstrates that there is no overwhelming economic crisis at PepsiCo. The multinational grew by 17 percent in comparison to the same months last year and in Latin America, grew by 5 percent. Last year, the company saw growth of 26.3 percent in its sales volume in Argentina, bringing in $4.8 billion. In the early 2000s, Balaguer and other workers were fired and fought for over a year to get their jobs back, winning support from students, teachers, and the community. When they did, these combative workers were elected to the shop-floor committee (comisión interna). “The mistreatment, the anger, and the pain taught us how to fight and how to organize,” Balaguer says. 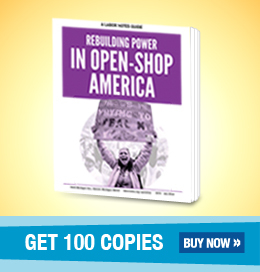 For almost a decade, the shop-floor committee led a fight for better working conditions and in solidarity with other workers in Argentina, holding frequent assemblies and confronting their employer. On March 8, for example, they organized a work stoppage for International Women’s Day. They were able to end subcontracting, making all of the subcontracted women a part of the regular workforce. About half the workers at PepsiCo are women. So when the workers saw that the company had shut the plant without notice, they were ready to fight. They first went to STIA, the national food industry union. Leaders said nothing could be done. Workers knew this would not be an easy struggle. President Mauricio Macri, known as the “CEO President,” has spent the first two years of his term instituting anti-worker austerity measures. Layoffs are common. Some workers fight, some don’t. Many end up demoralized. To face off against their own national union, the right-wing Argentine government, and the American multinational, the PepsiCo workers allied with human rights organizations, feminists, and unions, in an international campaign. Workers and their supporters blocked highways, organized concerts, and received thousands of photos and signatures in support, from within Argentina and from countries around the world. Artists, human rights activists, and a Nobel Peace Prize winner all expressed support. They also called for an international boycott of PepsiCo products. The occupation included a camp outside the factory, where workers and supporters sat around the fire on cold Argentine winter nights, drinking mate (the highly caffeinated Argentinean tea) and discussing politics or life late into the night. Workers livestreamed from the occupation to tell the world about their struggle. On June 7 an order of eviction came through, which workers promptly appealed in court. They organized mobilizations in the streets and received hundreds of statements of support, but the courts upheld the decision to evict. On July 13, hundreds of police in full riot gear arrived at the workers' camp to confront PepsiCo workers, students, and workers from other industries chanting “General Strike” and “Unity of the Working Class.” As the cops pushed the workers and students back, they began to throw tear gas, shoot rubber bullets at them, and beat them with batons. Several people were detained. The PepsiCo plant is located in a working class neighborhood and as the police arrived, neighbors took to the streets to bang pots and pans to show their disapproval. Neighbors took in protesters to protect them from the police, bandage their wounds, and give them water. When the police entered the factory, they broke a gas pipe to force the workers to leave. None of the workers were arrested, and they were escorted out by left politicians and human rights lawyers to make sure they were not abused. The eviction was broadcast on every major Argentine news channel. The response was immediate, with huge condemnation of the repression. The revered Madres de La Plaza de Mayo (who led resistance to the 1976-83 military dictatorship) called a protest for the same day. PepsiCo workers were called to major news channels to be interviewed and soon, the story had made its way to the international media, including the New York Times, the Washington Post, Fox News, and many other outlets. Just two hours after the eviction, the National Labor Court of Appeals ruled that PepsiCo had violated the law by firing the workers—and the court ordered their reinstatement. The law in Argentina states that workers cannot be fired before the company demonstrates that it has been going through an economic crisis for three years and tried all possible measures to maintain the jobs. The court ordered that the company be fined $5,000 per worker per day, in the event of noncompliance. This order will be appealed to a higher court that will decide whether PepsiCo really will have to give the workers their jobs back. As it is a mid-term election year, every politician in Argentina was forced to announce a position—even Macri, who said, “It’s illegal to take over a factory by force. It’s not right.” However, Macri had been planning to introduce a new anti-worker labor law that he was then forced to retreat from. The unions were also forced to take a stand. The General Confederation of Labor (CGT) called for a march in August, saying that it was to prevent other cases like PepsiCo. PepsiCo workers and other worker organizations, political parties, and human rights organizations were unwilling to wait until late August, though; they called a march for July 18, and 30,000 people took the streets. The workers set up a camp in front of the National Congress to organize a struggle against austerity and to keep their jobs. PepsiCo workers have made a national and even international issue out of the firing of 600 people, workers whose lives are considered insignificant to capital. Tatiana Cozzarelli is a writer and editor for Left Voice and a graduate student in Urban Education at the City University of New York. Sign the petition in support of PepsiCo workers or send photos and videos of support and solidarity to contact[at]leftvoice[dot]org.